Groovy Grammar Games - French is a collection of fabulous printable resources to drive home those important French grammar points. This resource includes 100 pages of printable board and card games plus blank masters to be adapted for all levels. Easy-to-follow teachers' notes are included. 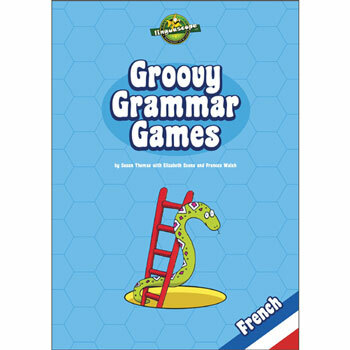 Groovy Grammar Games - French has been developed for use with ages 10+ who are at a beginner to intermediate level of French. Please note that Groovy Grammar Games is supplied as a printable resource (PDF format) on a USB-stick. It is licensed for unlimited printing for educational purposes by the purchasing institution. Click on the image below to download sample pages from Groovy Grammar Games - French.